Seventy years ago a Russian nun was killed in the gas chambers of the Ravensbruck concentration camp on March 31, 1945, Holy Saturday. As a nun she fed and housed the destitute, especially caring for the many Russian émigrés. But many intellectual émigrés met in her home to consider the renewal of Orthodoxy. A new phase of her life began with the German occupation of Paris. She began rescuing Jewish children from the Nazis, even hiding them in trash cans. For her there was no barrier between worshipping God and serving God’s people. For her, the service of the poor was another way of recognizing the presence of God in our world. May the example of Mother Maria Skobtsova move us to worship God and serve the poor. A tribute to Mother Maria by Jim Forest can be found here. Twenty-five year ago today, on March 30, 1990, Sister Thea Bowman, like a shooting star, went home to live with God. A black member of the Franciscan Sisters of Perpetual Adoration, Sister Thea lived out a vocation of being an African-American Catholic in a white congregation in a largely white Catholic Church. She preserved African-American traditions and incorporated them into her way of living her Catholic faith, that she had embraced as a ten-year old in 1947. What does it mean to be black and Catholic? It means that I come to my church fully functioning. I bring myself, my black self, all that I am, all that I have, all that I hope to become. I bring my whole history, my traditions, my experience, my culture, my African-American song and dance and gesture and movement and teaching and preaching and healing and responsibility as a gift to the Church. She lived this out in many ways, including co-founding the Institute of Black Catholic Studies at New Orleans’ Xavier University. But in 1984 she was diagnosed with breast cancer, but still maintained a busy schedule of speaking, finally from a wheel chair as her cancer progressed. When I first found out I had cancer, I didn’t know what to pray for. I didn’t know if I should pray for healing or life or death. Then I found peace in praying for what my folks call “God’s perfect will.” As it evolved, my prayer has become, “Lord, let me live until I die. : By that I mean I want to live, love, and serve fully until death comes. If that prayer is answered…how long really doesn’t matter. But these are not just words for those suffering or dying. They are words for all of us, fitting words for Holy Week when we recall Jesus who handed over his life in love. a word that may rouse them. How many people are weary, worn down, discouraged? How many need a word to encourage them, to help them come out of the darkness? I see this around me here in Honduras. Young people who see little future, because of low wages or no work. A young man lamenting that his common law wife left him and took their child. A young man recalling the death of his three month old last June. A woman who mourns the death of a son and grandson killed last year. Another woman who lost her husband last year to heart disease. Families struggling with relatives suffering cancer. Sometimes I do not have a word to say to them. At times I only have a listening ear. But we need the Servant of the Lord who knows the word that will give us courage in the face of the pains and suffering around us. Sometimes we want someone who will rescue us – a Superman who will make all things right, a King who will come with his cavalry to rescue us at the last moment. Jesus, seated on a donkey. A God made flesh who knows how to suffer, who gives himself as a servant, washing our feet – and letting his feet be washed. A God who speaks with His love and mercy, with his solidarity with us. A God who loves until death – so that we might have hope. A God who conquers death, not by tearing himself down from the cross, but by rising on the third day. our land and our nation. The chief priests are afraid of the consequences of Jesus’ preaching. They see it as provocative and a threat to the Romans. How we have domesticated Jesus. He is no longer a threat – neither to our lives nor to the status quo. Or we see him only in terms of culture wars – rather than in terms of the in-breaking of the Reign of God, the covenant of peace that Ezekiel promised (Ezekiel 37: 26). Yesterday, walking the Way of the Cross in Dulce Nombre with the parish here, I witnessed all the sin and evil that afflicts us here in Honduras. A story and photos can be found here. What would happen if we started to live as Jesus called us? What if we lived as people who care more for others than for our selfish interests? What if we lived like Jesus, giving ourselves over to living the mercy and love of God? What if we spoke truth to the powers around us, as Jesus did? Would we be persecuted as he was? Would we be maligned and martyred as Monseñor Oscar Romero was. thirty-five years ago? Or would we be lauded? How can we begin to follow a non-domesticated Jesus – on the Way of the Cross? Today our parish here in Honduras will walk the Stations of the Cross in the streets of Dulce Nombre de Copán. 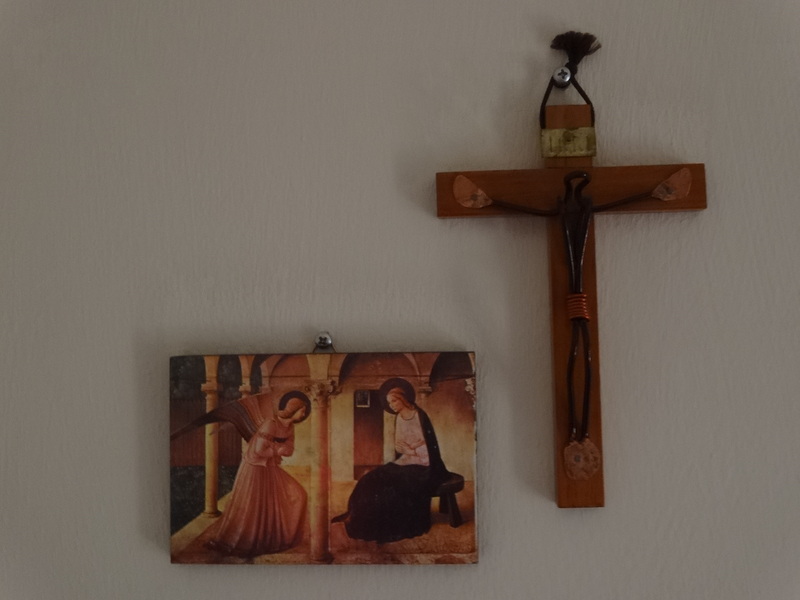 Padre German has asked the communities to come with a cross bearing images, symbols, or names of the sins that afflict us. Padre has encouraged the people to think not only of personal sins and failings – selfishness, greed, infidelity, resentment, addictions, etc. – but also the social situations that afflict the people, that cause the poverty and violence around us – the greed of the rich who buy up the land, the violence and a judicial system that does not work, corruption, and more. At the end of the Stations, as part of the penitential rite of the Mass, they will be burned in front of the church. In the midst of all this violence and poverty, the people long for hope, they long for a rescue from the power of the wicked and the power of wickedness. Deliver us from evil, Lord. and pitched His tent among us. I wonder what Mary was doing that day in Nazareth when the angel came to her. Some pious images have her praying. One of my favorite images, Fra Angelico’s fresco in San Marcos in Florence, has her seated with her arms crossed. But maybe she was kneading bread or washing clothes or preparing wool for making clothes. Maybe she had just returned from drawing water at the local well and was resting after the walk. Maybe she was laughing and playing with cousins or nephews and nieces. I like to think that God made the announcement to Mary in the midst of her everyday activities, to remind us that we find God anywhere and everywhere, that God calls us in the midst of our daily lives – not to escape, but to make God incarnate in the ordinary aspects of daily life. More than ten years ago I had the blessing to spend almost two weeks in the Holy Land, hosted by a friend who was volunteering with a Lutheran Church in Bethlehem. I spent one day alone in Jerusalem, during which I walked the Via Dolorosa, the Sorrowful Path, the Way of the Cross. What struck me most was that ordinary life was going on in the streets of Jerusalem, probably as it did on the day Christ carried his cross to his crucifixion: parents walking with their children, people selling from their small shops, even soldiers leaving their barracks. In the midst of ordinary life, Christ was conceived and Christ was crucified, The extraordinary is revealed in the ordinary. This morning while reading the account of the women caught in adultery (John 8: 1-11) I noticed that Jesus was sitting when the Pharisees approached him with the unnamed woman. Jesus had sat down to teach – as was the custom for teachers in his day. The seated Jesus is the teacher, the one with authority. Then he bent over again. And the Pharisees quietly slipped away – beginning with the oldest. Jesus is left alone with the woman – though there may have been others looking on. Jesus treats the unnamed woman as a person to be addressed personally, as he treated the religious leaders. He doesn’t speak to her in a condescending way, without looking at her. He treats her as a person – not as a tool in an ideological battle. Can we today begin to treat all people – sinners like ourselves, but caught in sin – as real persons, loved by Jesus, worthy of dialogue and discussion? Jesus frees her to begin anew, not held bound by condemnation or her past.